With these models, you have attractive designs that blend easily with any décor. These diffusers consume little power and they are capable of producing just the right combination of essential oil and water into the air. What is Best Essential Oil Diffuser for Large Space in April, 2019? URPOWER 1000ml OD-A002 1000 ml 269sqft as humidifier 430sqft for aromatherapy 23 in low mist mode, 15 in high mist mode, 10 recommended hours Night lamp, humidifier, and aroma diffuser Check our Review! InnoGear 500ml 500 ml Up to 269sqft 17 hours in low mist mode, 8 hours in high mist mode Ionizer, humidifier, air purifier, aromatherapy diffuser, night light Check our Review! VicTsing 400ml﻿ 400 ml 269sqft aromatherapy 215-269sqft humidifier 7-10 hours Night lamp, Aroma diffuser, and humidifier Check our Review! ASAKUKI 700ml Premium 700 ml From 215-269sqft Up to 20 hours continuously Night lamp, Aroma diffuser, and humidifier Check our Review! BESTEK 500ml Glass 500 ml 1000sqft 8-18 hours Ionizer, humidifier, air purifier, aromatherapy diffuser, night light Check our Review! If you are ever worried about the dry air in your house, dry skin, rhinitis, or stressful work days, you’ll want to consider an essential oil diffuser for your home. The URPOWER 1000ml OD-A002 is just the ideal model. It produces amazing LED colors to set the mood in your home. The device is useful for aromatherapy and it also works great as a humidifier. This URPOWER product has a 1000ml capacity. It will give you long hours of use since you won’t need to do a refill in the middle of the night. The device uses 3-5 oil drops for every 100ml and it works perfectly to help you sleep better and stress-free. The diffuser can run non-stop for 23 hours in low mist setting, but you can set the timer in three modes: 3 hours, 6 hours, or 9 hours. The low mist mode will give you 15 hours ensuring you have a peaceful night’s sleep. Here you have a device that uses ultrasonic technology to produce the required 2.4million vibrations that break down essential oils into healthy compounds without generating any heat. The micro-particles produced are readily available for absorption into the body, thus giving you relief from allergens, and clearing the air of impurities like stale air and second-hand smoke. It also doubles up as a humidifier to provide relief from dry skin, sinus irritation, and dry air. After a while, you can start reaping the benefits of this diffuser as you will be living stress-free from the hours of breathing into clean air. Your immune system also benefits from becoming stronger and able to fight diseases faster. Do you mind that you must touch the diffuser to turn it on or off? With a wireless remote control, you’ll be able to make changes to the various settings from up to 5 meters away from the essential oil diffuser. You can change into a high or low setting, choose a light color from seven, or even set the timer on the diffuser. It is a convenient method of operating the device when you are not close to it. This diffuser is suitable for an area of 430 square meters. And this is a large area given its size, only 186 by 121 mm. In addition, this device works as an additional humidifier. It can cover 269 square meters. With the auto-shut-off function, the device will shut down when the water runs out. It comes in handy when you are asleep or out of the house. This diffuser is super quiet so you will sleep without the constant disruptions of water trickling. The InnoGear 500ml is a simple device that produces fine, cool mist. It works to provide a relaxed and stress-free living space away from everyday hassles. It comes in a medium-sized cylinder to cover all corners of a large room. It is an attractive design that will sit well with any décor. This device works as a night lamp, humidifier and aromatherapy diffuser. It is designed using a vibrating diaphragm and with the help of ultrasonic technology, it produces a stream of mist which can run for up to 17 hours in the low setting and 8 hours in the high setting. It has a strong scent that everyone will be looking forward to coming home to. It improves the indoor air quality of your house by releasing negative irons which lift the mood and help in relieving stress. You can run the light on without the mist, run the mist without the light or combine both. It is a versatile device with four-timer options and two mist modes. You can set the timer to release mist after 60, 120, 180 minutes or when in the ON setting. The light button allows cycling through seven color settings when you need to set the mood of the moment. The 500ml water capacity means that InnoGear does not need constant refilling. It comes with a convenient measuring cup which eases with the input of the water. This model can run with tap water or distilled water although the manufacturer recommends using with distilled water. For the aromatherapy oils, you’ll want to use only 100% pure essential oils to prevent clogging or corroding the diffuser. Although this diffuser has a compact size, 168 by 121 mm, it can cover with aroma an area of up to 350 square meters. Our personal tests have shown that he can do much more. And if you use natural essential oils with a strong odor, such as citrus, vanilla or anise, then they cover a 1500 square meter house. And literally every corner smells a subtle scent. Try to use distilled water to work the diffuser. If not, then use very soft filtered water. This will allow you to clean the diffuser less often and there will be no problems with the operation of the mist mode. Are you looking for a decorative piece that doubles as an essential oil diffuser for your vast living room? The VicTsing 400ml is a beautiful design in the shape of a flower vase with a construction from modern wood grain. It can blend with just any décor, thus it’s ideal for yoga and physical therapy studios, office, spa, or children’s room. The 400ml uses ultrasonic technology to produce a cool mist with a lovely fragrance. It can diffuse 30-60ml of mist per hour which can reach out to spaces of up to 269sqft. The VicTsing has four timer settings: 1hr, 3hrs, 6hrs, and ON mode. The timing options will go with either the high or low mist settings which deliver 7-9 hours of working time. When the device is out of essential oils, it can humidify rooms of up to 215sqft. This way, you will receive relief from dry air thereby creating a relaxing environment. The ultrasonic waves vaporize 100% pure-water soluble essential oils to mask nasty odors from tobacco, pet odors, etc. The VicTsing operates using two buttons. The mist button helps in choosing the timer and modes while the light buttons provide cycling between the different LED lights. You can choose from seven light settings that can either be dim or bright. It comes in handy when you want a beautiful nightstand light or desk lamp. Just choose your favorite color and set the mood for a romantic dinner night. Apart from being a great aroma diffuser, this device works fine as a humidifier. When you are out of essential oils, just fill up the product with water and experience as the product adds moisture to the air. It is great on dry skin more so if you live in cold environments. This way, you’ll breathe better and sleep restfully than if you were just using an air conditioner. This model is convenient in everything. It has a nice design, average capacity and maximum work time of 6 hours. This means that you can safely put such a diffuser in your bedroom and its continuous work will last until the morning. Thanks to the backlight, the device looks like a small night light. This device is ideal for night work. But if you want to leave the diffuser to work all night, just follow the dosages of essential oil. You should not pour more than 1 drop per 400 ml of water if the area of your bedroom is less than 100 square meters. Even if it seems to you that the aroma is not enough, use small doses at night, otherwise you will get a headache. Style and design meet functionality in the ASAKUKI 700ml Premium. It has an interesting design from eco-friendly materials. It utilizes high-grade compounds which make baby products. It is, therefore, BPA free designed to be used by the whole family. This diffuser produces 2.4 million vibrations with the help of the ultrasonic transducer. It helps to generate microparticles from the water and essential oil. These compounds when breathed into the body, improves respiratory and immune systems. The mist also assists to clear symptoms of the flu or cold. For those who have exceptionally dry skin, you will love that it works to moisten skin to a noticeable glow thanks to the humidifying effects. Not to mention, it also helps to relieve stress and users will also see improved sleeping patterns. The 700ml chamber is easy to refill and to clean. It can run for up to 20 hours creating a comfortable home environment. ASAKUKI has two levels of mist functions. The timer can be set into either continuous or intermittent mode. One button will assist in choosing the times you’ll need for the device to start releasing mist. This is from 1hr, 3hrs, 6hrs, or continuous function when the device is ON. It also allows simple color mode selections between automatic cycling or one fixed LED color. The auto-off function is a useful safety feature that prevents overheating of the device when it runs out of water. This diffuser is very versatile. It is small in size, only 6.3 x 6.3 x 5.5 inches. Thanks to the LED lighting function, at night it looks like a space cube right on your bedside table. The capacity of the water tank is average. And this additionally to fill the air with a relaxing aroma and moisture. It is very useful for people with very dry skin. This diffuser is needed in a house where there are small children. And if your area has a very dry climate, then this device should work around the clock for your health. Also, this diffuser is very useful for offices. Aromatic oils create a working mood and protect employees from frequent diseases. In a large city, such a device is necessary in every office. When you want to create a healing environment for yourself or your baby, a scented candle does not always cut it. That’s where the BESTEK 500ml Glass comes in. It is designed to help diffuse the healing properties of essential oils into every corner of an exceptionally big area. The diffuser is BPA free and it features a protective glass cover. The BESTEK model features a 500ml water tank. You’ll just have to fill it with tap water and the essential oil of your choice, and start enjoying its therapeutic effects. The ultrasonic waves run quietly such that it won’t wake a sleeping baby or interfere with your home’s working environment. This model helps to improve symptoms such as dry eyes or dry skin as it pumps high levels of moisture into the atmosphere. The interior diaphragm produces microparticles without altering the quality of essential oils. It offers all-day air purification that assists in alleviating coughs, dry sinuses, and relieves stress. If you worry about a cracked tank you will be happy to choose the BESTEK model. It utilizes superior grade plastic with a wooden element at the bottom. It is sturdy, tough for every-day use. With this diffuser, 10 hours is ideal for continuous running. Also, you should consider replacing the water often so that it won’t acquire a foul odor. Gurgling noise can be heard when you are too close to the device. As you embark on a search for the best essential oil diffuser for a large living space, it’s important to consider the following features and functions. Essential oil diffusers are tools that work to get essential oils into the air where people can get their benefits. The particles they produce are distributed throughout the air so you can easily breathe into them. Attracting customers. Yes, you read correctly. If you have a large area of the house, you create mood with essential oils for yourself. But if you have a shop, cafe or large office, you will be able to attract more visitors with the help of essential oils. According to experts, the most pleasant smell for people is vanilla. A couple of drops of this oil and an investment in the diffuser can increase your income. Different essential oils have different effects on the user. Some can irritate mucous membranes, while others have harmful effects on animals, birds, and fish. Ultrasonic Diffusers. These devices pass electric current to a disk element which vibrates up to millions of times thus spreading the essential oil in form of a mist into the air. They help to create an aromatherapy environment as the mist is cool. Ultrasonic technology ensures that the oil is not heated so its integrity is not altered. They are best recommended for essential oils. Evaporative Essential Oil Diffusers. 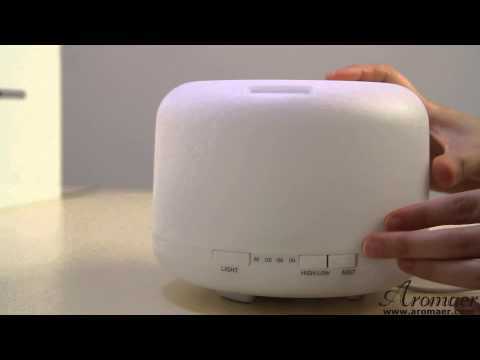 These types of diffusers use a fan to blow air into a pad with drops of essential oils. It causes the oil to evaporate fast and fill the room they are intended. Therapeutic properties may diminish when using an evaporative essential oil diffuser. Heat Diffusers. These are diffusers that use direct heat like that of candles to diffuse the oil rapidly into the air. They are more silent than ultrasonic devices, and have an economic sense to them. Only that, aromatherapy effects cannot be maximized with these diffusers. What is the capacity of the diffuser for large space enough? To have a diffuser cover a large area, it depends on the size and how long the device can run. For large spaces you’ll need to put more oil from 3-5 drops of essential oil per 100ml of water. This will give you enough coverage to reach every corner of the room. Coming from the sizes of diffusers that are on the market, you can take from 400 ml to 1000 ml. To better understand what capacity will suit you, give an answer to two questions. How often do you want to use a diffuser? What is the area of your space? If you flavor more than 400 square meters every day, you need the largest diffuser, such as URPOWER 1000ml. For non-frequent use on an area up to 450 square meters, you can choose a device for 400 ml. Also, we give you the formula with which you can accurately determine how much tank volume you need. This is true for evaporators. One drop of essential oil allows flavoring an area of 10 square meters. According to the instructions, the diffuser takes 3 drops of essential oil per 100 ml of water. This means that each 100 ml of water allows you to aromatize 30 square meters of space. Every hour on average 50 ml of water evaporates. This means that the diffuser will fill with 15 square meters of perfume per hour. Now it is not difficult to calculate that the 1000 ml device will fill an area of 300 square meters in 20 hours of continuous operation. Now you know how the effect of flavoring depends on the duration of work and the size of the tank. Count and choose for yourself the right size. Are Essential Oil Diffusers Toxic to Animals and Birds? It all depends on the type of essential oil used in the diffuser. Cats are particularly more sensitive to essential oils, according to ASPCA. Oils high in polyphenolic compounds as found in tea tree, cinnamon, clove, oregano, thyme, birch, and wintergreen can be harmful to a cat’s health. On the other hand, dogs can be allergic to thyme, juniper, anise, clove, garlic, and yarrow. Birds are seen to be toxic to pine, cedarwood, and citronella. According to the essential oil you choose for your diffuser, it’s always important to use them safely around pets. If you are unsure about a certain essential oil, always consult with a veterinarian. Are Essential Oil Diffusers Safe Near Human Beings? Essential oils should be avoided near the eyes, nose, mouth, or skin. If you have asthma and allergies, essential oils with a strong fragrance can trigger a negative respiratory reaction. They should not be used around pregnant mothers, newborn babies, and young children. Near Fish Tanks. Most essential oils do not mix with water. As such, they may end up on the water’s surface cutting the fish’s supply of air, thus leading to death. Near Electronics. Electronic devices may get damaged if the diffuser pumps out high levels of moisture which result in too much humidity in the air. That’s why a low setting on a diffuser is recommended. Near Plants. Essential oils have been seen to have great benefits on plants including ridding of pests and encouraging pollination. They can be used safely around gardens for the intended purpose. Why fog mode doesn’t work? This is a common problem for many users. Therefore, I will once again remind the reasons that prevent the occurrence of mist. If you use hard water, you can lose the mist after few time. In addition, if you use oils with high density, you also lose it. Try to use essential oils of good quality. These are the two main reasons for losing mist, not counting physical damage. When you encounter a malfunctioning evaporator, simply clean it. Instructions for cleaning you will find in this guide. Regular cleaning of an essential oil diffuser will help to keep it in good working condition. You don’t want to wait too long for the device to break down to start taking care of it. First, consult customer service on the correct method of cleaning a particular diffuser. What is the best place to put an essential oil diffuser for a large space? First of all, you need to find out for what purposes you need a diffuser. If you want to flavor the living room or add flavor to the bathroom, this will be the best place for a diffuser. But if your goal is to fill the whole house with aroma, then it is better to put it in the place of free intersection of air flows. For example, in the living room, hall, near the stairs. It is also better to place a diffuser on the ground floor if you have a high-rise building. The fragrance will always spread upwards. Can essential oil diffusers be used as humidifiers? Although commonly advertised to work as both diffusers and humidifiers, essential oil diffusers rarely add enough moisture to make noticeabe difference in a room. As such, the purpose of the two should remain independent. It’s not a great idea to use one for the other. However, if you buy a diffuser, the air will be moistened anyway. The only difference is what area can cover by your device. But to find out exactly, buy a diffuser and measure the humidity in the room before and after it. Experts recommend maintaining air humidity within 60%. If your performance is less, then you need to buy a humidifier separately. Timer. A timer helps to set the diffuser to release the mist after the hours you have selected. For most diffusers, it is usually 1 hour, 3 hours, and 6 hours. The timer can also be set in a continuous mode so that it releases mist every time it is in the ON setting. Bluetooth. A Bluetooth function comes in handy to connect to your phone when you want to listen to your favorite songs as the device diffuses aroma into your home. Remote Controller. A wireless remote controller is essential when you want to operate the diffuser from a distance. Diffusers with remote controls allow changes to the timer settings, mist modes, and light from a distance of up to 5 meters. With a clock and with an alarm clock. Some diffusers have clocks for basic displaying of the time. Others have the additional function of an alarm clock where you can set it to ring at a specific time of day like when you wake up in the morning. Light. Nearly all essential oil diffusers are designed to produce LED lighting. They are great options for having different colors of light to set the mood or basically use it as a night lamp. Candles release a designated scent when the wax melts. The scent fills a room but it dissipates quite fast. Essential oil diffusers release a mist with a sweet fragrance according to the oil in the diffuser. The fragrance is produced slowly and it can linger for hours if not days. They are better for using every other day as they only need refilling with water and the essential oil. Essential oil diffusers for large rooms are simple and functional devices when you want to create a therapeutic environment. They have numerous benefits, and we believe you can’t go wrong with one of the brands in this article. If you want to use essential oils for aromatherapy applications, purify air, relax your mind and de-stress, these models will be great for you. For those with pets or are asthmatic, you may want to be cautious about essential oil diffusers. Otherwise, you will be happy with your purchase. Thank you for you nice sharing. I heard that oil diffusers can help to relieve pain, especially headaches. it it true? if it is true then which is the best oil for it? You heard it right. Essential oil helps to reduce muscle pain. There is lot’s of different kinds oil you can try. I personally like juniper and anise. You can also try Rosemary essential oil. Actually, there is huge list. Just try some different type and see what make you feel more comfort. Everything i want to know about diffusers is in this beautifully written article. It could not be more clear. I have made up my mind, thanks you so much. Can you tell the best way how to clean urpower diffuser? May I use tap water for my oil diffuser? I have seriously hard water, I think it is not right. What water should I use cold or warm water then? Thank you for your question! You can use tap water if you have a water softener system. The best solution is distilled mixed with tap water. It will work great! To extend the life of your diffuser we recommend you to use bottled water if you don’t have the opportunity to soft your water somehow. As for temperature, we think you may use room temperature water so your diffuser will use less energy to heat it. It is not important. But if you like to use cold water, you may do it. Cool water will become warm, so it doesn’t matter. Is oil included in the package? We are sorry but oils are not included. You should but them additionally. What is the length of power line of Uppower diffuser? Hi! The length is 170 cm. My Uppower diffuser is leaking. Who knows the reason?